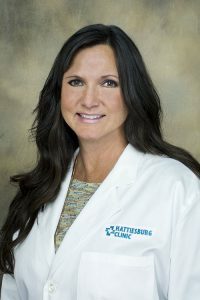 Emily E. Key, CNP, is a certified nurse practitioner at Hattiesburg Clinic Weight Management. She received a Master of Science in Nursing from the University of South Alabama in Mobile, Ala., and a Bachelor of Science in Nursing from The University of Southern Mississippi in Hattiesburg, Miss. Mrs. Key is board certified by the American Academy of Nurse Practitioners and is a member of the American Association of Nurse Practitioners and American Nurses Association. She has more than two decades of experience in health care. At Weight Management, Mrs. Key helps individuals combat excess weight and maintain a healthy lifestyle. This is done through ongoing consultations and evaluations; meal replacement programs; and diet and exercise recommendations.